Graduation season is upon us and I recently bought some old grad photos that crack me up. Where are the smiles? The overflowing joy at having made it? The goofiness? Maybe this was the typical pose of this era (’20s/’30s). Anyway, I hope these photos make you smile too! Here she is modeling a jacket I’m selling. Let me just say (which will come as no surprise) that finding and buying things is the fun part of this biz. But the day of reckoning came and I had too much unlisted stuff so I hunkered down for days and listed! Honestly for two days I didn’t go anywhere and even took a much-needed break from personal hygiene!! Trying to photograph clothes without a model or mannequin is challenging. My lovely (and tall) older daughter makes a great model, but is so busy these days, it’s hard to pin her down. So I’m stuck photographing clothes on hangers or laying them on a table…not ideal! 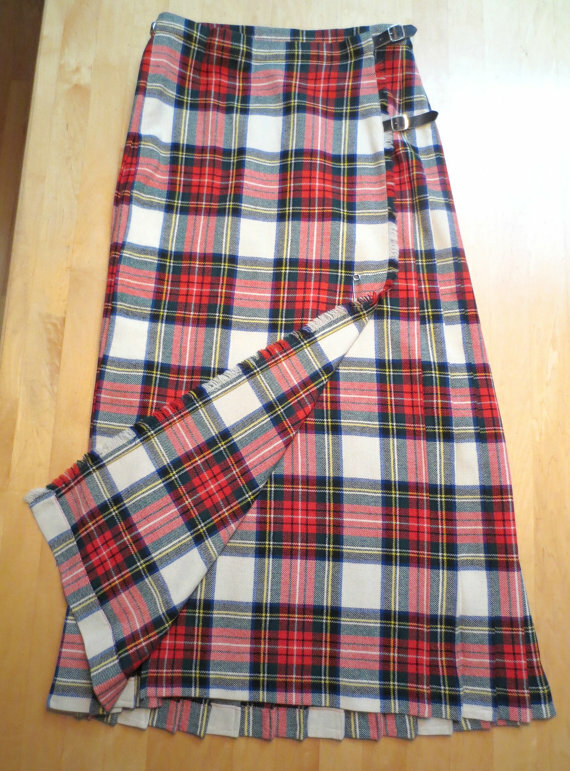 Take this skirt for example. 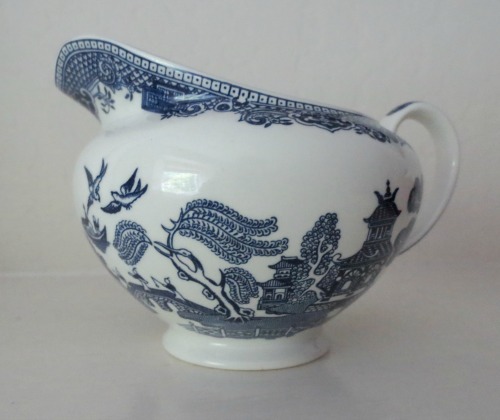 I bought this for a snip at an estate sale. It’s a long, ladies wool kilt with leather buckles in the Stewart Dress Modern tartan (I researched this!). It’s beautifully made. No holes and just two tiny pinpoint marks. But it looks darn boring on my table. It needs a young lassie (with a 30″ waist and some attitude) to showcase it! As a treat to myself after so much tedious listing, I popped into my local Goodwill for 30 minutes. But I was STERN with myself. No clothes (except great ties or vintage Levis), no ’70s brown studio pottery pieces (I have enough for sale, thank you very much), no dubious art prints or crazed china or silverplate. No, no, no. 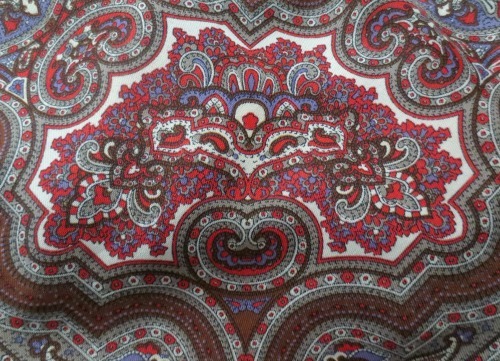 And I found a pristine light-weight wool paisley shawl that I love so much I may keep it for awhile. It will be perfect for my upcoming trip to upstate New York. Yes and while in NY visiting family, you know I will be hunting for cool vintage things too. There’s an antique store in my hometown (one of those amalgamations of dozens and dozens of sellers) that I’m particularly keen on visiting again. It’s a mish-mosh of interesting bits with generally reasonable prices that are sometimes negotiable. 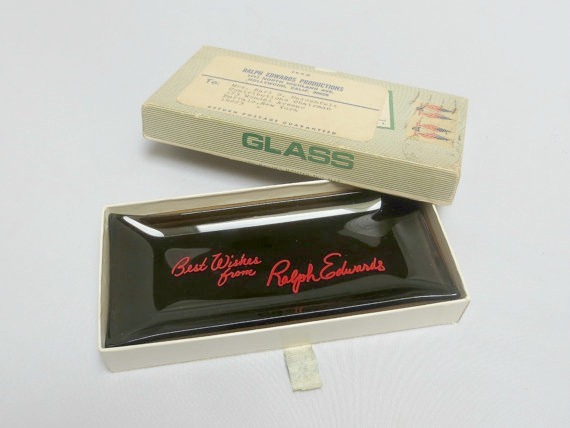 Here’s one of my favorite finds from my last visit…a glass tray from the Ralph Edwards Production Co. (Hollywood, CA) sent to a woman in Buffalo as a thank-you gift. Having the original box makes it perfect! Anyway, it’s time to get back to listing more inventory! I get vicarious pleasure out of your “huntings”. Keep it up! I’m too lazy to go out anymore but did enjoy years of roaming the way you are now. No regrets!